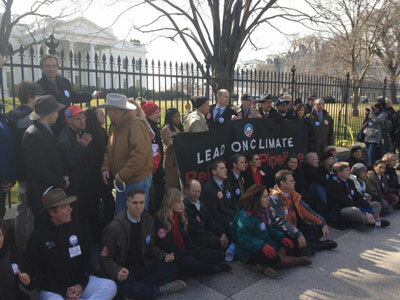 Nearly 50 environmental activists were arrested outside of the White House Wednesday afternoon while protesting the planned Keystone XL pipeline. Demonstrators gathered in downtown Washington, DC on Wednesday to voice their opposition to the project, which would install a massive pipeline from the Canadian tar sands to the Gulf of Mexico, stretching from the north to the south of the entire United States. After using zip-ties to cuff themselves to the fence outside the White House, 48 protesters were arrested, including activist Bill McKibben, actress Daryl Hannah, civil rights leader Julian Bond and Robert Kennedy, Jr., the nephew of former president John F. Kennedy. US President Barack Obama previously halted the Keystone project in order to call for a more thorough investigation into potential health and environmental concerns caused by the pipeline, but just last month the head of the Environmental Protection Agency said she would soon leave her position, a decision that some say comes from a change of stance expected soon from the president. According to New York Post’s report last month, EPA Administrator Lisa Jackson told anonymous sources that the president will sign off on the project as soon as this spring, despite pleas from critics to reconsider further. “The Keystone pipeline has become the purest test that there's ever been on whether the president is serious about doing something about climate change or not," 350.org founder McKibben said earlier in the day during a speech at nearby Lafayette Square, The Hill reports.